"Cloves are poached in oil, transforming them into delicate, sweet & tender morsels"
1.To defrost garlic cloves, simply put the required frozen cloves in your hands, run under warm water for a few seconds before patting between two paper towels to wick the moisture off. 2.Place garlic cloves in a medium heavy-bottomed saucepan. Add the oil. (The oil should covet the cloves by 1/2". You may need a bit more or less oil, depending on the size of the pan you use.) Heat pan over medium heat. As soon as small bubbles appear, reduce heat to very low (or the lowest setting on your stove: the oil should not reach above 220F (104C) and only small bubbles should form in the pan. 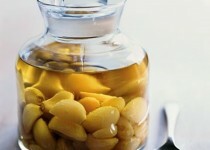 Cook the garlic for 40 to 45 minutes, stirring from time to time, until it is very tender and the cloves look pale-golden. Remove pan from heat and set aside, allowing the cloves to cool in oil. Store in an airtight container and refrigerate for up to one week. 3. 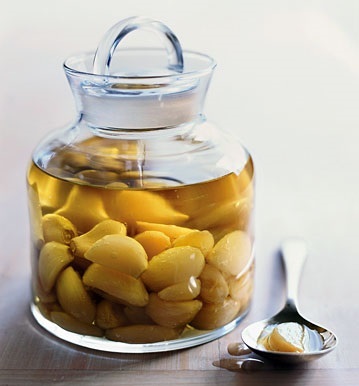 Cook's Note: Bring garlic confit to room temperature before using, as the oil will firm up when refrigerated.